We’ve already talked about how to apply eyeliner and mascara. We’ve talked about how to make your eyes look bigger and we’ve talked about how to get rid of dark circles and puffiness around your eyes. What’s left? Eye shadow of course. Properly applying eye shadow is something a lot of people have a hard time with. In an article I have planned next week, we’re going to talk a little bit about the whole package with a step by step guide on how to get various eye makeup looks like cat eyes, smoky eyes and things of that nature. We’re also going to talk a bit about different eye shapes and what you can do to accentuate your natural eye color. 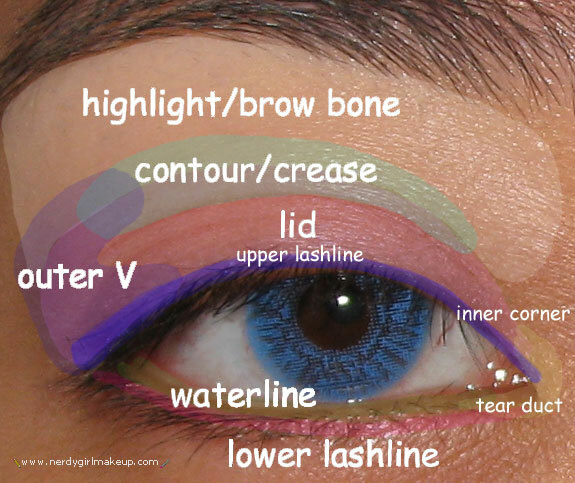 For right now though, I’m just going to walk you through the basics of applying eye shadow properly. Ready? Let’s get started. Brow Bone: This is where you’ll usually by putting highlighter or soft tone products. Crease: This is where you’ll be putting contouring colors like your darker eye shadow shades. Lid: This is where you’ll be putting your base color. Upper Lash Line: You won’t be paying much attention to this one with eye shadow. It’s generally where your eyeliner will go. Outer V: We won’t really be paying attention to the outer v in the basic tutorials I’ll be sharing here but we’ll get into it when we move on to more advanced tutorials. Inner Corner: The inner corner will only really be touched on a bit in the tutorials at the end but we’ll do a little more with it in later tutorials. Tear Duct: Same as above. We’ll use this but not in the two tutorials in this article. Waterline: We’re going to talk about the lower water line but only in the tips section. We’ll talk about why when we get there. Lower Lash Line: Not to repeat myself, but this is another one we’re going to save for more advanced tutorials. Now that we have that out of the way, let’s talk about shadow. I’m going to start off with some basic tips on applying eye shadow and then give you two step by step guides on applying eye shadow. The first guide will focus on powder eye shadow and the second will focus on cream eye shadow. First, the tips. Leave your waterline alone. It’s perfectly acceptable to use your eye shadow for eyeliner but don’t, under any circumstances, put eye shadow on your lower lash line. First, it will basically be a wasted effort as shadow won’t stay in place on your waterline. Second, putting shadow on your waterline is a great way to irritate your eye. Leave the waterline to your eyeliner. Invest in a decent eye shadow base or primer. If you want your eye shadow to stay in place all day, you’re going to want to use an eye shadow base or primer. Now, when I say ‘decent’, I don’t necessarily mean expensive. My personal favorite base if from ELF cosmetics and it cost me about $3. If you’re not sure about a product you can check user reviews online to see what people are saying. You just want a good base to put your shadow over. That’s really all that matters. Learn how to blend. Blending can be a bit tricky but if you give yourself a little time to practice you should be able to get the hang of it. Stick with neutral colors when you’re just getting started and stick to different shades in the same color family. For example, start with a light brown, a medium brown and a dark brown. Browns look great with any eye color. You’ll be putting the different shades on different parts of your lid. We’ll talk about that more in the guide at the end. Experiment with it and practice blending until you’re happy with your look. Choose the right colors for your complexion and your eye color. It can be hard to know what kind of colors you should use so just play around with different colors until you find colors you love. Again, you’re going to want to stick to shades of the same color family at first but as you get more comfortable with blending and using shadow you can try bolder colors or contrasting colors. It’s really up to you. Just try out different things until you like what you see. Avoid deep color on the brow. While this definitely creates a bold and dramatic look, it is not always bold and dramatic in the right ways. I know a lot of celebrities rock dark deep colors on the brow in magazine shoots but they’re in magazines. It doesn’t look nearly as good in real life. You can use shadow on the brow but stick to neutral tones. You want the shadow on your brow to draw attention to your eye, not distract from it. Be careful with dark shadow on your crease. Dark shadow on your crease can open up your eye and really compliment the look you’re going for but only if it’s done properly. You’re only going to want to blend the dark shadow on the outside edge of your eye. If you don’t get it right, you’re going to make your eye look smaller and that’s generally not something you want. Don’t be afraid of white shadow. A little dab of white shadow at the corner of your inner lower lash line can make your eyes look brighter and bigger. Both of those things offer the added bonus of making you look less sleepy. You don’t need a whole lot of white to make this look work. Just a touch will do it. You can also add white to your brow as highlighter but make sure you blend it well. In this first tutorial, I want to walk you through a great look that is perfect for work, school or a casual outing. Step One: Wash your face and apply eye shadow base from your lashes to your brow. Step Two: Apply the medium shade you’ve chosen and apply it to your eyelid, allowing it to get into the crease just a little bit. At the outside edge of the lid, you’re going to sweep the shadow out slightly. This compliments your lashes and makes your eye look wider. Step Three: Apply the light shade over your medium shade and continue it up to your brow. You’re going to sweep this shade out at the outside corner of your eye just as you did with the medium color. Step Four: Take the darkest color and apply it to the crease of your eyelid. I would recommend using an angled brush for this but if you don’t have one, you can use the tip of your eye shadow wand. You need to be very careful with this darker color. You could easily wind up making your eye look smaller. You’re going to draw a line from the inside of the crease to the outside of the crease using a very light touch and making sure you’re only using the tip of the wand. If you use too much, it’s just not going to look right. As you move from the inside to the outside, you can allow the line to widen. Continue applying this darker color up just passed the crease line. At the end, bring the line to connect with the outside of your lashes. Step Five: Using either a clean makeup wand or a Q-tip, soften the darker color so the line doesn’t look as sharp or severe. You don’t need to blend it in entirely. Step Six: Smudge the darker color into the edges of your lashes. Now you’re done! I love cream eye shadow. It offers beautiful, rich color but if you’re used to using powder shadow, cream can be a bit hard to get used to. To be honest though, using powder shadow isn’t all that different than using cream shadow. Hopefully this guide will help if you’re having trouble. Step One: Prime your eyelid as you would for applying shadow. Step Two: Use your finger, a shadow wand or a makeup sponge to dab your cream shadow onto your eyelid. Take a moment or two to make sure the color is evenly distributed over the lid. Step Three: Use a large makeup brush to dust a thin coat of translucent powder over your lid to set the color. One of the biggest problems with cream eyeliner is the fact that it doesn’t stay in place well. Translucent powder fixes that right up. You can also use a matching powder shadow but I find that robs the cream shadow of a bit of its luster. Step Four: Apply eyeliner and mascara. If you get dots of those products on your shadow, you can remove the dots with a Q-tip and then just re-blend the shadow. Pretty simple. Once you’re feeling more confident with your cream shadow you can play around with using more than one color or blending multiple colors together. this article is so detailed. thank you so much. i will still research on how to choose color shades, from highlighter, meduim and darker shades. bcos when you buy an eyeshadow make up, the colors r basically dark, not often light.